This article and photo was published by Al-Fanar on Nov. 5, 2014. King Saud University in Saudi Arabia is the best university in the Arab region, according to rankings released by U.S. News & World Report. The American news organization, known for its rankings of the best colleges in the United States, announced its first Arab region list in a session yesterday at the World Innovation Summit for Education in Doha, Qatar. 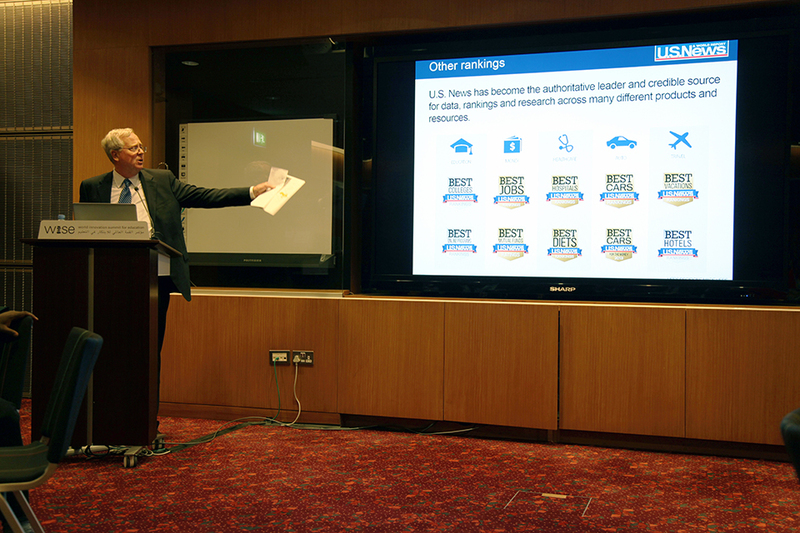 The rankings are part of U.S. News’ strategy to reach a wider global audience, provide Arab students an avenue through which to compare local universities and enable higher education institutions in the region to benchmark themselves, said Brian Kelly, editor and chief content officer. “Rankings Mania” is sweeping through the region with QS and the Times Higher Education ranking teams also courting universities in the Arab world. In the U.S. News rankings, out of more than 800 universities in the region, 91 universities from 16 Arab countries were ranked based on their research. To make the cut, a university had to have published at least 400 papers from 2009-2013. The schools were evaluated on nine indicators, including how often other scholars cited peer-review articles by authors associated with the university. Universities in Saudi Arabia claimed the top three spots in the 2015 Best Arab Region Universities overall rankings. But Egypt had the most universities that made the cut —23 percent of universities included came from there. The report also included 16 subject area rankings, such as for the social sciences, medicine and chemistry. Branch campuses —a university whose main campus is located in a different country —were not considered since their publications are tallied as part of their parent university’s citations, explained Robert Morse, chief data strategist for U.S. News & World Report. Branch campuses are also categorized under the parent university in U.S. News’ annual global university rankings, he added. The Arab region rankings did not distinguish between a university’s undergraduate and graduate programs. The 91 universities ranked can be considered the top in the Arab region, said Kelly. However, only two of these made U.S. News’ 2015 Best Global Universities rankings. These were Cairo University and King Saud University, which ranked 443 and 473 respectively out of 500 universities. Audience members who attended the session challenged the ranking results and methodology. Several expressed concern that focusing only on an institution’s research output would not give parents and prospective students a true sense of the quality of teaching at a university. Some also said the rankings may skew towards universities focused heavily on hard sciences since academics in these fields typically publish more articles than those in the humanities. U.S. News also relied on Scopus, an abstract and citation database under information solutions company Elsevier, to compile the bibliometrics. A representative from Elsevier said that due to technological limitations, the rankings could only consider published articles that had abstracts and meta-data written in English. One audience member said that since quality Arabic scholarly journals were not included, that could have meant that some universities should have ranked higher. These initial rankings analyzed only bibliometric indicators, Morse said, because other data, such as student satisfaction, enrollment and post-graduation employment rates, are not readily available in the region. Kelly added that U.S. News hopes to add other indicators to future rankings, such as reputation surveys distributed to academics and employers. The rankings were funded in part by a grant from Qatar Foundation, a nonprofit education organization that sponsors the annual WISE conference and funds several American and European branch campuses in Doha. The full rankings are available on the U.S News & World Report website.